There's no easy way to say this, but I'm pregnant. And, while I'm not usually into sweets, they say that motherhood — or impending motherhood — can change your tastes. If my delicate condition has amplified my appetite for cookies, pastries and other treats, I'm viewing it as a food-writer development opportunity. Why not take these nine months to dive deep into the world of sweets before I give birth and revert to my usual salty self? Many days, that means ice cream for lunch. Or dinner. Or whenever. In service to Baby Egan (currently about the size of a Napa cabbage, according to the internet), I'm eating as many whole, organic foods as I can, which is easy enough since I usually eat organic anyway. But ice cream is one of the major exceptions. As luck would have it, last month, Eco Bean + Juice + Café started serving organic creemees in vanilla-maple and maca-cacao flavors. 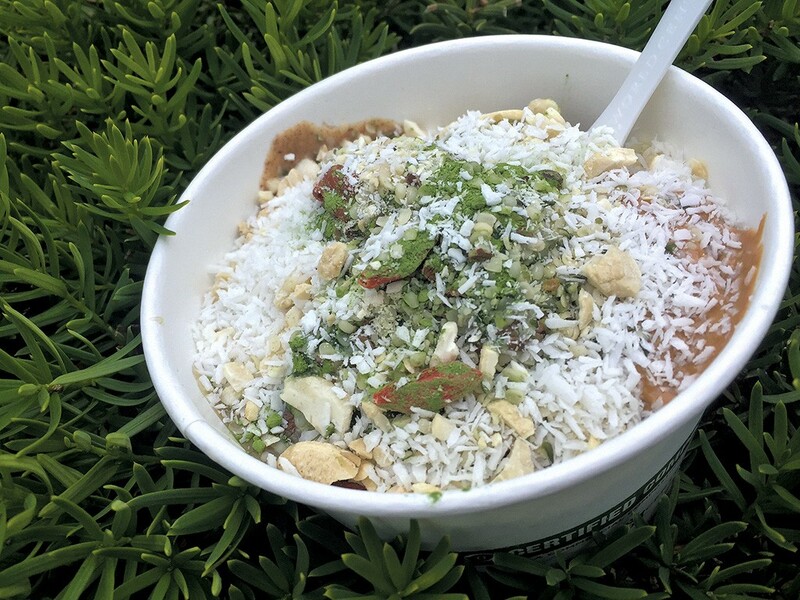 The health-focused company uses all organic or GMO-free ingredients at Eco Bean + Juice on Pine Street in Burlington and at Eco Bean + Greens, which opened in January in South Burlington's Blue Mall on Dorset Street. The new soft-serve is made in small batches in-house with cream from Kimball Brook Farm in North Ferrisburgh. It's available at the Dorset Street location only. That was reason enough for me to stop for a frozen snack on my way out of town last week. A medium-twist creemee was $5.50 and was served in a bowl, not a cone, because Eco Bean's owners hadn't been able to find ones that were organic, vegan and gluten-free, the server said. The menu advertised a dozen or so toppings (75 cents each), which included everything from acai to almond butter to hemp seeds. I was very hungry and a bit sleepy, and choosing among the toppings (flax seeds or goji berries?!) was more than I could manage. So I decided to skip deciding altogether. "Can you just put everything on it?" I asked. The counter guy was flummoxed. "Are you sure you want to do that?" "Uh, yeah," I said, hesitating a little. Is this going to be gross? "Do you want me to check the price first?" "Nah," I said, "I don't care how much it costs." I felt a little eccentric and a lot decadent saying that, like I was channeling some fitness-obsessed trophy wife (minus the buff body) for whom very expensive ice cream was the norm. Baby Cabbage needs all the good nutrition, I reasoned to myself. Also, this whole not-drinking-alcohol-during-pregnancy thing is saving me a ton of money, so splurging on things like ice cream power-food boosters seemed reasonable enough. "All right," the dude said, and got to work. With tax — and a $2 tip, because sprinkling almonds, almond butter, cacao nibs, cashews, coconut flakes, flax seeds, goji berries, hemp seeds, raw honey, peanut butter and matcha powder in spoon-size doses over ice cream is a lot of work — the whole shebang came to $18.77. The final product looked like an antioxidant-rich forest floor might, if viewed through a kaleidoscope. The coconut flakes gave a fuzzy lichen effect. The protein-dense seeds and nuts recalled tiny river pebbles. The immune-boosting, antibacterial, anti-inflammatory, antifungal, vitamin-and-mineral-rich goji berries — rust-red and wrinkly — looked like little mushrooms or rose hips poking through a fuzz of metabolism-speeding matcha moss. And the allergy-fighting, enzyme-filled honey? Pine pitch, definitely. After photographing this dietary masterwork from several angles, I sank a spoon in it. It tasted somewhat hippie-crunchy in the way that health superfoods do, but each bite was dynamic, highly textural and wholly silly. Most amazing was that all the flavors worked well together. The soft-serve base was creamy and not too sweet. The vanilla-maple tasted basically like a vanilla creemee, and the maca-cacao was subtle, bright and definitely more complex than a standard chocolate creemee. I dug the sweet, dry scent of the coconut flakes with the cacao nibs' roasty bitterness and sharp crunch. The peanut and almond butters were warm against the frozen cream — strange and kind of fascinating — and nice with the goji berries' bittersweet, fruity crisp. The flax seeds gave crackle, while the tiny, floral grains in the honey melted in and around everything in the most pleasant way possible. And I reveled in the caffeine boost from the matcha. If you wanted to, you could find yourself deep in a dietary rabbit hole by trying to quantify all the vitamins and minerals in every bite, but I was more than satisfied knowing that it was absolutely the most nutrient-dense ice cream I'd ever eaten. Which kind of begs the question: If it's that good for you, is it still ice cream? The original print version of this article was headlined "Super Creemee"